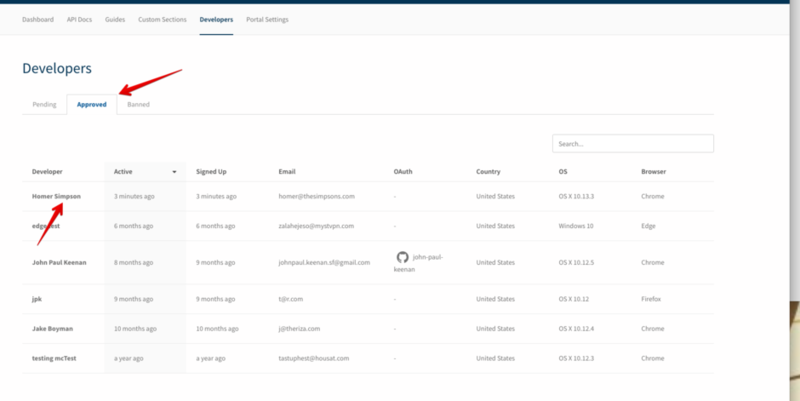 Once you have given someone access to your portal, they will also have access to make calls against your API (depending on how you’ve configured your instance). From time to time, you will need to remove a developer’s access from Gelato. To do this, log into your account and select Developers from the navigation. Making sure you are in the Approved tab, click the name of the developer you would like to remove access from. That developer will no longer have access to the portal. After this has been completed, the user will be moved to the Banned tab. If you decide they need access again at a later date, it can be granted through there.